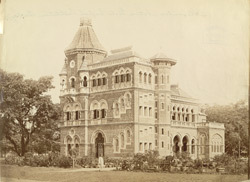 Photograph of the Alexandra Native Girls' English Institution in Bombay from the 'Album of architectural and topographical views, mostly in South Asia' taken by Shivashanker Narayen in the 1890s. According to the Imperial Gazetteer of India there were 134 secondary and 1,760 primary girls' schools by 1871. The Alexander Native Girls English Institution was built by Khan Bahadur Muncherjee Cowasjee Murzban (1839-1917). Murzban was born in Bombay and trained at the Engineering College in Pune. He oversaw the construction of the General Post Office and the Chief Presidency Magistrate’s Court in the city. This view reveals the Neo-Gothic architectural style of the building.